In the fast-paced world of business, the most impactful teams are those that are made up of individuals with separate strengths, talents, and aptitudes who work together toward a common goal. As simplistic as this idea seems, assembling a winning team is more than randomly collecting a few people and giving them an assignment. In reality, the process of connecting the right people takes time, careful consideration, and communication. As cliche as it is to use a sports analogy to describe assembling a winning team, it illustrates this particular point perfectly. Many sports franchises build a team around one star player they believe to be the key to winning games. The idea is that if the star is given the tools he needs to succeed, the rest of the team will support him in his efforts. While the narrative of having a star performer gives leaders a consistent story line of potential success, it also presents two challenges to the team’s overall function. First, building a team around a “star” performer often fails to recognize the contribution of the remaining team members. Michael Jordan was arguably one of the greatest basketball players of all time, but he would have been unable to lead the Chicago Bulls to championships without Scotty Pippin and Steve Kerr. Yet, during the height of the team’s success, the bulk of the attention was on Jordan’s accomplishments and often failed to recognize the rest of the team’s abilities. Second, using the “star” mentality tends to create team conflict. One study published in 2016 found that when a team perceives it is functioning well and a task conflict comes along, interpersonal conflict tends to remain at a minimum. The reverse is also true. When a team feels as though they are performing poorly, task conflict breeds interpersonal conflict as well. This is especially damaging when there is a “star” performer around which the team is built. All is well as long as the team continues to feel successful, but as soon as their perception is challenged, not only will they tend to turn on each other, they will turn on the person who has been identified as the key to their success. Faultline Theory in management is based on the idea that in an effort to create demographically diverse teams we are, in reality, creating invisible fault lines along which teams can fracture. In forming teams that bring together those of different ages, genders, nationalities, tenures with the company, education, and functions, companies want to form a cross section of talents, abilities, and backgrounds that represent either the customer or the views of the company. However, many teams in one study by MIT were incapacitated by their diversity. Not only did they fail to deliver products on time, they were unable to come up with innovative solutions. Yet teams emerged that were able to succeed in spite of invisible fault lines. The difference? Their leaders’ ability to focus on task orientation when the team was first formed then switch to relationship orientation once the team has experienced success. Only then can a team feel empowered to discuss any relationship conflicts that may appear along deeper fault lines based on personality or work style. As simple as it sounds, getting the right people on your team and the wrong people off seems to escape many managers. Instead, they opt to try to “fix” the existing team members under the guise of organizational or personal development. In reality, the process of making changes within a work team takes attention to the overall team goal and the individual strengths of team members along with a hefty dose of courage. The best teams are comprised of fewer than 10 people with clearly communicated lines of accountability and performance measurement. Leaders of these teams are also unafraid to make changes when the team’s success is threatened by one or two performers who are a poor fit. 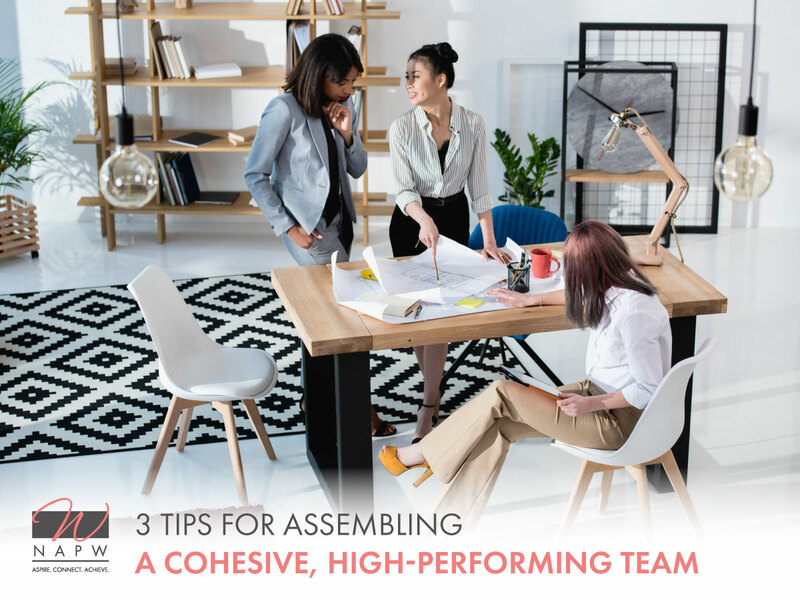 While assembling winning teams may seem like a daunting task, nearly 75 percent of employers feel as though collaboration is vital to their organization’s success. To connect with other women who have successfully assembled, contributed to, or managed effective teams, join NAPW‘s e-Chapter today.